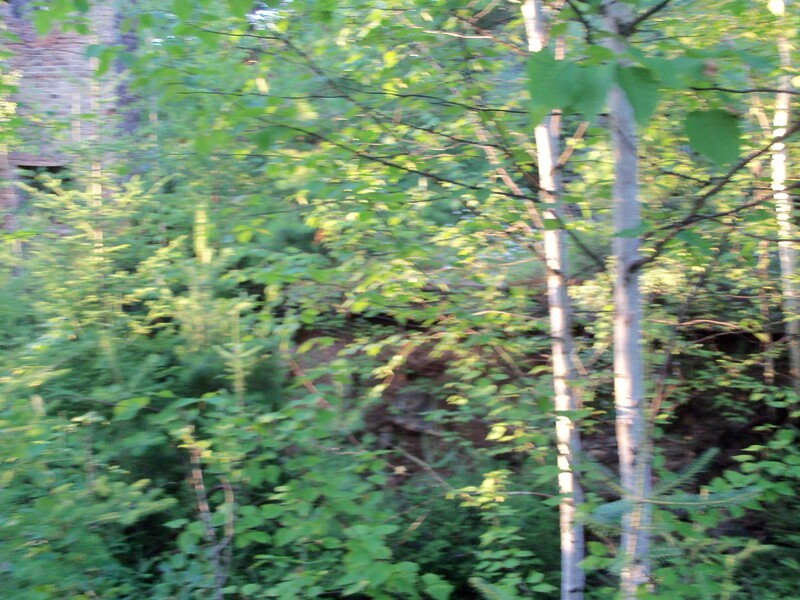 A trip to Northern Wisconsin is not complete without a trip to one of the nearby famous haunts. With cameras and recording devices in tow, my family and I all pile into the mini-van. We drive forty minutes into Michigan to view the mysterious Paulding Lights. 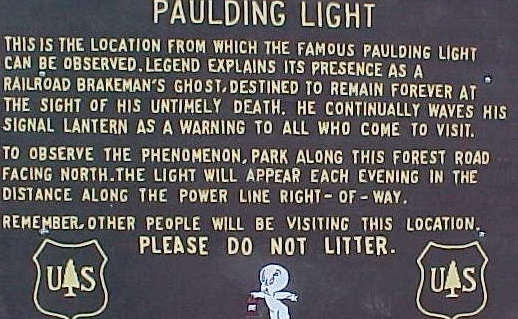 Since the 1960’s, people have been reporting the mysterious lights that appear in a valley outside of Paulding Michigan. The legends that surround this phenomenon say that a railroad brakeman died one night while trying to stop two trains from colliding on the tracks that were formerly in the area. 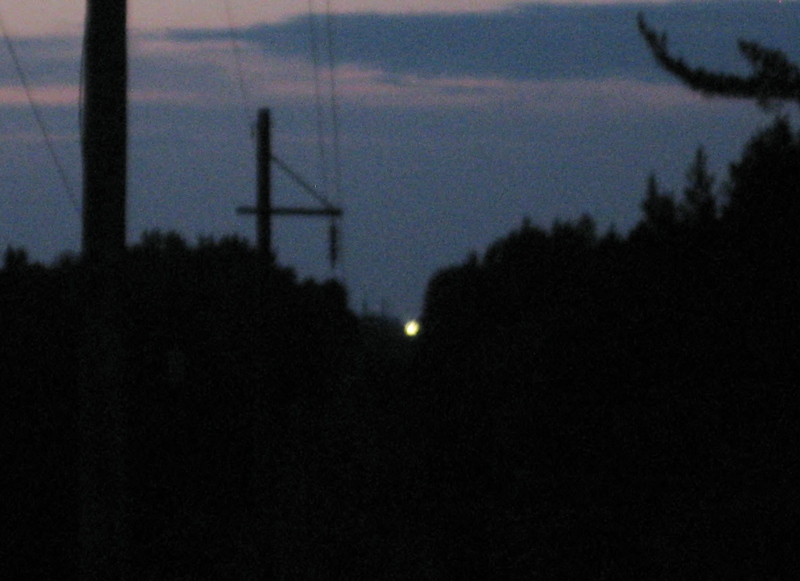 The lights are supposedly the light from his lantern as he walks up and down the area where the tracks once stood. It takes us a while to find the long road that leads to a viewing area to see the lights. It is dusk as we pull up to park on the gravel road. There are many cars parked before a chained off and barricaded section of a narrow valley. Taking our gear from the van, we walk amongst the other thrill seekers. The atmosphere has a carnival like setting with kids playing and people milling about just waiting for the show to begin. We position ourselves on the top of a hill where we have a good view of the long valley and the horizon. The sun is about to set. Suddenly, the noise of the crowd stops and we all observe the light. It is bright and white. It looks almost like a spot light way off in the distance. It rises and sets as if it is a distant moon. Then there is a red light that behaves in the same manner. The only sound is of camera shutters clicking and murmurs of voices describing the event on video. My family and I wait to see the show happen once more before we climb back into the van. All the way back to our cottage, we discuss the possibilities. What could those lights be? In 2010, the SyFy Channel featured the Paulding Lights in the show Fact or Fiction: The Paranormal Files. Investigators from the show tried to solve the mystery of the lights by recreating the phenomenon with a car’s headlights beamed toward the site. (One of the common debunker’s theories) They also had an airplane flyover with a spotlight. Ultimately, the investigators could not prove that the lights had any reason for occurring. They marked the file “unexplainable”. The Paulding Lights are a sight you have to see for yourself. The next time you are in the Upper Peninsula of Michigan you may wish to bring your camera and view the lights. 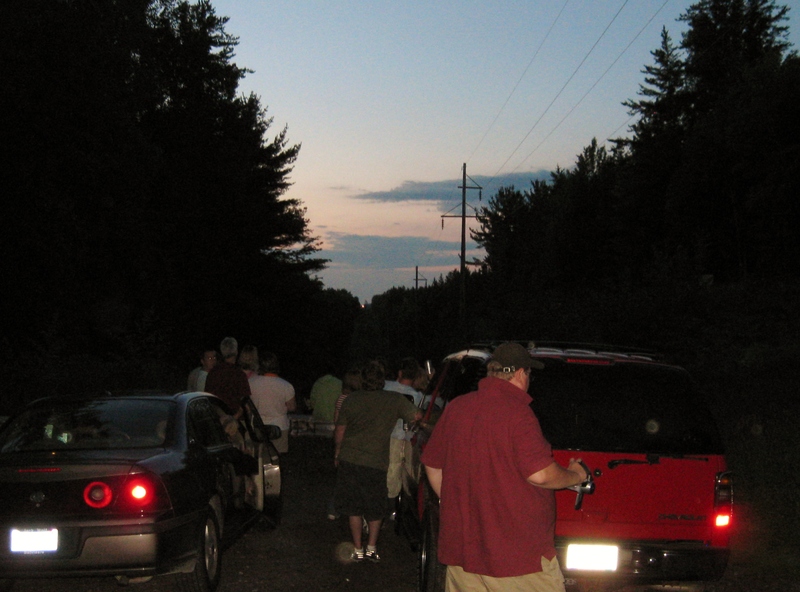 Visit Backwoods, Wisconsin to find directions and more information on The Mysterious Paulding Lights. Posted in Grandmother's Ghost Stories and tagged Fact or Fiction, family, Ghost Stories, Grandmother Musings, Grandmother's Ghost Stories: The Spaulding Lights, Lights, Michigan, Paranormal, paranormal files, Paulding Lights, paulding michigan, postaday, railroad brakeman, Unexplained. Bookmark the permalink. It is that time of year again, when the wind howls and the darkness invades the deep recesses of our imaginations. A time of ghouls, ghosts, and goblins that float into a flap of reality to scare all those whose senses are heightened. This is the beginning of the series: Grandmother’s Ghost Stories. The stories will be running on Grandmother Musings during the month of October. Some of the stories are new, some are familiar, and some have been told and re-told for generations. Read and enjoy. If you have a ghost story of your own that, you would like to share, please contact me at bigsmileu1@comcast.net. Driving home on a raw, windy October evening, Jake decided to take a short cut through the forest. The road was slick with a cold drizzle and the trees hung like skeleton arms over the narrow strip of highway. It was a spooky autumn night. Annie, Jake’s long time girlfriend shivered in the passenger seat. Seeing this, Jake turned up the heat in the car a notch. “Thanks,” Annie said as she rubbed her arms. Jake winked at her and reached over to rub her thigh. He felt comfortable with Annie. She had been a part of his life since they started at Deacon High. She was his girl, his friend, and he hoped his wife someday. The car warmed up quickly and just as Annie felt the chill of the cold leave her, she suddenly experienced a new kind of chill. A deer appeared on the road ahead of the car. Jake responded quickly and slammed his foot on the brakes to avoid hitting the deer. The wet pavement aided in spinning the car out of control, and by the time Jake was able to stop the car; they were facing the opposite direction. “Oh…oh, my God!” Annie whispered her face white with blood loss. Jake hit his palms against the steering wheel. “It’s okay, it is okay.” He said trying to calm Annie as well as himself. Jake turned the key in the ignition attempting to restart the car. He was not sure why it had died during the spin, but he was sure it would start again. He tried it a couple of times with no luck and then hit the steering wheel so hard his palms stung. Jake looked in his rearview mirror hoping to see headlights or some sign of life. 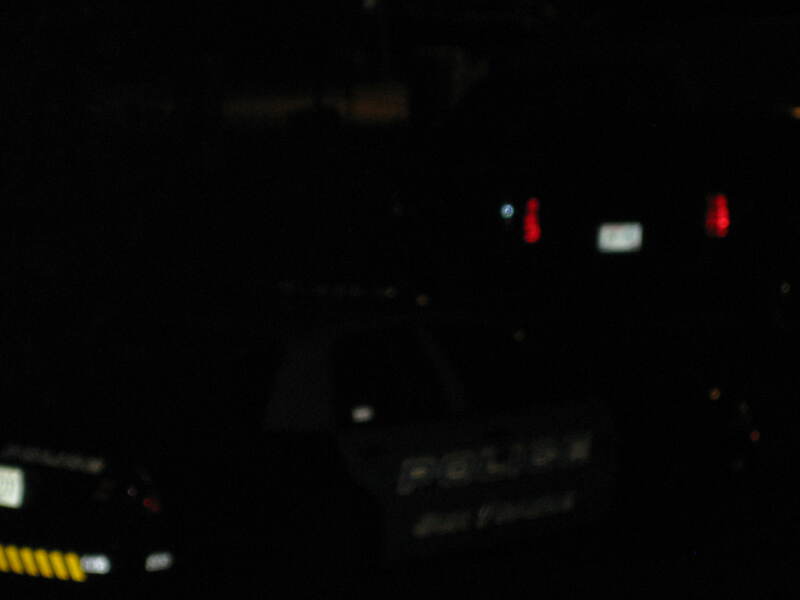 All he viewed were the red reflection of his rear lights on the pavement. He pumped his foot on the gas pedal twice and tried the ignition once more. Nothing. He could feel the anxiety radiating from Annie. She was scared and he saw in his peripheral vision the chill return to her trim frame. He had to get this car started! He left the car to look under the hood letting out some of the warmth the car had accumulated before the deer ran out in front of them. Annie watched as Jake jiggled a few things she knew nothing about under the hood and jumped when he angrily slammed the hood shut. He shouted an infuriated curse into the darkness. A blast of cold, wet air blew into the interior of the car as Jake slid behind the steering wheel and twisted the ignition in a useless effort. Finally, when the key made only a clicking sound, he stopped struggling and let out a frustrated groan. She placed her hand on his shoulder in support. He laid his head on the back of the headrest and stared up silently. His mind listed their options and finally he sat up. When he turned to her, he had a plan. Wrapped in a wool blanket Jake kept in the trunk, Annie followed Jake’s darkened figure with her eyes as he walked down the road. His plan was that he walk to the nearest place of business and call for help. Annie was to wait with the car until assistance came. She had argued when he presented her with his ideas. She had yelled, cried, and begged that he stay with her to wait for a car to come by. When the hysterics did not work, she pleaded that he let her walk with him for help, however, none her logic would change his mind. Ultimately, she decided to let him go, if only to save time fighting and hopefully get help soon. Jake made her lock the doors and check that the windows were rolled up tight before he left. He had taken the spare blanket he kept in the trunk for her to keep her warm and then kissed her goodbye. He promised he would come back as fast as he could. With nothing to do but listen to the howling wind, Annie put the bucket seat all the way back and curled in a fetal position to keep warm. Before she knew it, she was awakened by a sound of tapping on the roof. She lay there and listened for a few moments before she sat up and looked out the foggy windows. The wind was still whipping the tree branches and she decided that the insistent tapping must be a tree hitting the roof of the car. When she awoke once more, it seemed as if she had been in the car for hours. She looked around and thought she saw the sky lighten at the horizon. Could she have been there waiting for Jake that long? She shook off that crazy idea and swallowed the dreadful feeling she had in her stomach. She went back to sleep to the tapping tune that continued on the roof of the car. It was the banging on her window that woke her for the final time. She sat up quickly and caught the officer in his khaki uniform about to bang on the window again. Relief flooded her when she realized that help had finally come for her. Jake had done it. She was about to open the door, but the police officer motioned her to roll her window down instead. Looking at him with confusion, she followed his directive. “Miss, I would like you to gather your personal things and get out of the car on the driver’s side please.” The police officer spoke with quiet authority. Still confused, but happy that she would finally be out of the car, Annie scooted to the driver side and opened the door. The police officer was there to help her out and took her arm to lead her away from the car. She tried to turn and look back at the car. The officer anticipated this action and grabbed her shoulder to move her forward. “We will take care of it.” He assured as he helped her climb into the back seat and shut the door. Her mind was foggy and things seemed so surreal. She thought she should protest something, but she did not know what. The officer entered the car and put the car in drive. As he pulled away, Annie felt a horrific tug in her stomach and had to turn around to look at the place that she had spent the night. A scream rose deep within her throat when she saw what was going on around Jake’s car. Horrifying and unbelievable images appeared that would haunt her for the remainder of her life. It was only later; when she overheard the police officer explaining the night’s happenings to her parents did the realization of what had happened hit her. When Jake took off down the road to find help, he met up with a crazed man. The man slit Jake’s throat, and while Annie was sleeping, he hung Jake up side down in the tree branch that hung over the car. Jake’s lifeblood slowly dripped out of him and on to the roof of the car. All through the dark night, Jake hung, until a driver heading to his early morning shift at the factory happened along. When he saw the carnage, he immediately phoned the police. It was not the tree that was tapping on the roof, disturbing Annie as she tried to sleep, but Jake’s blood. Annie never imagined that saying goodbye to her love that night, would truly mean forever. Posted in Grandmother's Ghost Stories and tagged fiction, ghosts and goblins, Ghosts Stories, ghouls ghosts, Grandmother Musings, Grandmother's Ghost Stories: Goodbye Love, Halloween, October, postaday, Scary. Bookmark the permalink.